Alaska Republicans had a good night Tuesday. The GOP kept its majority in the state Senate. It flipped at least two seats in the state House. And took back the governor’s office. House members and senators are holding meetings this week to organize new caucuses leading each chamber. But it won’t necessarily be smooth sailing even if the Alaska Capitol ends up under one-party control, according to interviews with members. That’s because within the Republican Party, there are diverse ideas about Alaska government and contentious issues like the Permanent Fund dividend and the state budget. At a news conference Wednesday announcing the formation of a new Republican House majority, members said Rep. Dave Talerico of Healy, would be the new House speaker when the Legislature convenes in January. But Talerico struggled to describe the group’s organizing principles. Assuming Bart LeBon of Fairbanks holds on to a 79-vote lead after absentee and other outstanding ballots are counted, the GOP says it will have a 21 to 19 majority in the House. For the past two years, a largely-Democratic House majority coalition relegated most Republicans to the minority. Talerico ultimately arrived at controlling spending and drafting a sustainable budget as two of his caucus’ priorities. But here’s the thing: While GOP members share the same party label, they don’t always have the same vision for state government. For example, Republican legislators from coastal areas like Sitka and Kodiak might have different ideas about the importance of the state ferry system than, say, their counterparts from the road system. Then there’s the question of the Permanent Fund. Mike Dunleavy, the Republican just elected governor, wants the government to write checks to each Alaskan that could be more than $6,000 — to cover next year’s dividend and the amount that lawmakers reduced dividends in the past three years. But Anchorage Rep. Lance Pruitt, who Republicans say will co-chair the House Finance Committee next year, isn’t so sure about that. There are also ideological divides within Pruitt’s own group of House Republicans. 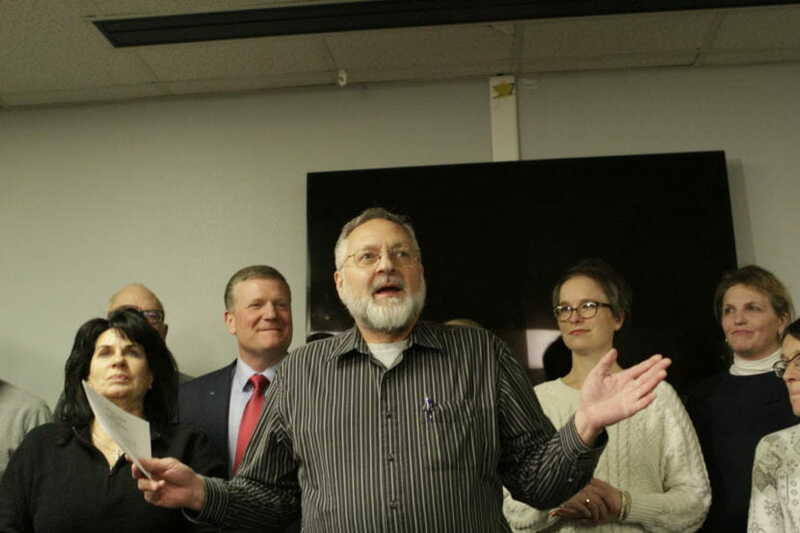 One of the most conservative GOP members, Wasilla Rep. David Eastman, has frustrated some of his Republican colleagues by staking out uncompromising, far-right positions on the budget and social issues. One of his Republican House colleagues, Gary Knopp of Kenai, said he’s not sure whether Eastman will fit into a GOP caucus, or whether Eastman wants to be part of one. At Wednesday’s news conference, Republicans said Eastman will be part of their new House majority. But Eastman wasn’t in the room, and he didn’t respond to a call or text message to confirm his membership. Without Eastman, the new Republican majority would have just 20 seats in the 40-member House — which isn’t a majority at all. Internal divisions within a majority caucus in the Legislature are nothing new — it’s normal when you’re trying to get more than 20 people to agree on subjects as complicated and polarizing as Permanent Fund dividends and closing a budget deficit. The outgoing House majority, which is mostly Democratic, had its own dispute about this year’s Permanent Fund dividend. And three years earlier, six members of the previous Republican-controlled majority rebelled when their leaders proposed a complicated financial maneuver to balance the state budget. What’s different is that next year the Capitol could be under one-party leadership — setting up higher expectations for Republicans to produce results. But Pruitt, the Anchorage Republican representative, said debate and dissent are a welcome part of the legislative process. Other members of the new House Republican majority leadership announced Wednesday: Cathy Tilton of Wasilla will chair the House Rules Committee; Tammie Wilson of Fairbanks will co-chair the House Finance Committee with Pruitt; and Chuck Kopp of Anchorage will be majority leader. Those positions are all contingent, though, on LeBon keeping his lead, and on Eastman agreeing to be a member of the Republican caucus. In a prepared statement Wednesday, the current Democratic House speaker, Bryce Edgmon of Dillingham, said it’s premature for the GOP to focus on its new organization, given that there are still unresolved races and uncounted ballots. A spokeswoman for the Senate GOP said that group plans to form a new majority caucus by the end of the week. Republicans have at least 13 seats in that chamber, with one seat still too close to call — the race for a Fairbanks district between incumbent GOP Senate President Pete Kelly and Democratic Rep. Scott Kawasaki. Kelly leads by 11 votes, 4,048 to 4,037.